Unemployment in Spain is at 27%. Young people are fleeing Portugal and Ireland. One-in-four Greeks say they have difficulty paying for food. Despite the Depression-era conditions, however, Europe has no crash plan to get people back to work. Under the German-engineered strategy to escape the euro crisis, struggling southern European members must continue to cut public spending, lower wages and grind down prices until they're competitive again. At current rates, it could take a decade or more to complete the process, according to studies by Goldman Sachs. All the pain being endured raises the question: Is there a breaking point at which Europeans simply say, "Enough"? Certainly, Europeans have protested austerity. But despite some scares, no country has left the euro. Support for remaining in the common currency remains high, even though there is widespread disenchantment with the European Union. Over 60% of Spaniards, Greeks, Italians and French want to keep the common currency, according to a survey published this month by the Pew Research Center. Euro doomsayers who expected Greece would tumble out of the currency last year have seemingly underestimated Europeans' willingness to put up with years of hardship rather than gamble on an exit. But European officials who point to the stability of pro-euro sentiment may be making the opposite mistake. Europeans' reserves of patience are deep, but surely finite. "Just the sheer enormity of quitting the euro has so far militated against a surge in support to leave," says Simon Tilford, chief economist at the Center for European Reform, a London-based think tank. Once people feel there is no light at the end of the tunnel, however, "we'll probably start to see a more open debate about the costs and benefits of remaining in the single currency," he says. "And once you see that debate, things could happen quite quickly." It has happened before. Like countries that joined the euro zone, Argentina in the 1990s gave up control over its own currency, fixing it 1-to-1 to the U.S. dollar. That tamed hyperinflation, but it also allowed a borrowing binge in dollars that pushed up wages and business costs. Like southern Europe today, Argentina became deeply uncompetitive and the country's currency couldn't fall to make its goods attractive abroad. Like euro members today, Argentina had to grin and bear it until wages and prices fell far enough for the country to become competitive again. Conventional wisdom at the time was that Argentines would bear any hardship to keep using the U.S. dollar, so seared were they by decades of political and economic chaos that included periods of four-digit inflation. 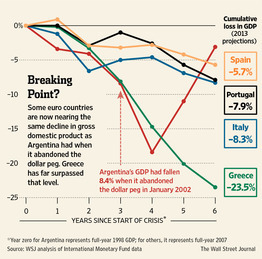 "Devaluation is not an option in Argentina," a World Bank economist said at the time. "With such a high dollarization level, a devaluation would be too costly." Technically, Argentina had its own currency to return to, but abandoning parity with the dollar was seen as too excruciating to undertake, because almost all debts and business contracts were in the U.S. currency. After three years of recession, though, Argentines appeared to decide en masse that whatever came next couldn't be worse than the unending depression needed to keep their pesos interchangeable with dollars. On a balmy night in December 2001, the middle class took to the streets of Buenos Aires in an explosion of rage. Riots across the country swept the government from power. Argentina defaulted on its debt soon after, and then the country abandoned the peso's peg to the dollar. How similar is the situation in southern Europe today? Argentina's economy had contracted by around 8% in the three years before the uprising. By the end of this year, Italy's and Portugal's economies will have shrunk by around 8% from their peak, Spain's by around 6% and Greece's by more than 23%, according to the International Monetary Fund. EU policy makers who take comfort in the apparent popularity of the euro should consider that Argentines also widely supported the dollar peg—right up until the moment they exploded. In a poll published in December 2001, the same month that Argentines rioted, just 14% said the currency regime should be scrapped; 62% said they wanted to keep it. That's virtually the same proportion of Spaniards and Greeks who say they want to keep the euro today. 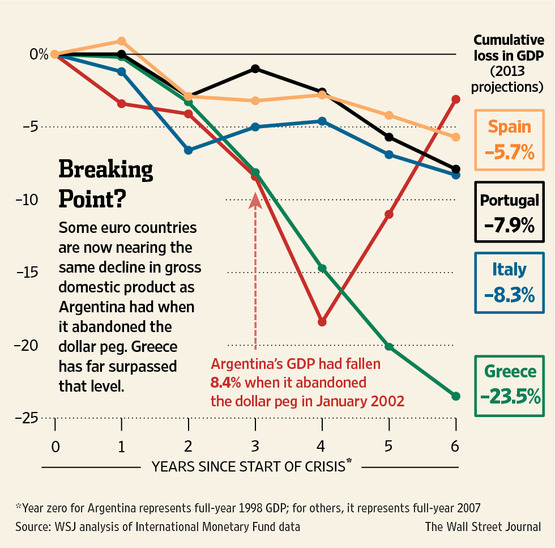 Argentina, with its ups and downs since devaluation, isn't a model for Europe. Rather, it's a cautionary tale. In late 2001, Argentina's economy minister called the country's dollar peg "a permanent institution," whose unthinkable collapse would cause "the dissolution of the basic institutions of the economy and society." A month later it was gone. Those who say the risk of countries leaving the euro has gone away should consider other times when people viewed a currency regime as sacred, right up until the time they swept it away.